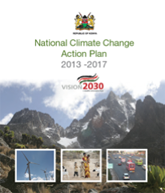 Kenya launched its National Climate Change Action Plan on Wednesday, 27th March 2013. 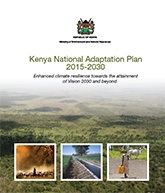 The plan was developed from 20 months of analysis and consultations; and addresses the options for a low-carbon climate resilient development pathway as Kenya adapts to climate impacts and mitigates growing emissions. The plan also addresses the enabling aspects of finance, policy and legislation, knowledge management, capacity development, technology requirements and monitoring and reporting. The comprehensive NCCAP document is supported by almost sixty technical reports developed by teams of international consultants guided by Kenya based thematic working groups and under the oversight of a multi-sectoral multi-stakeholder taskforce. The call for action on climate change arising from the Plan was evident from the remarks from the speakers at the event. The Chair of the Kenya Climate Change Working Group (KCCWG), John Kioli, spoke of the impacts of climate change on Kenya’s communities and the need for urgent action. The Planning Secretary in the Ministry of State for Planning, National Development and Vision 2030, Mr. Wainaina, speaking on behalf of the Permanent Secretary, highlighted the emphasis that climate change has received during the development of the Second Medium Term Plan with the efforts to mainstream it as an economy-wide issue. KEPSA CEO, Carole Kariuki underlined the opportunities and the importance of the private sector in the implementation of the plan; while Dr. Julius Muia, Executive Secretary of the National Economic and Social Council (NESC), stressed NESC’s commitment to the issue of climate change. Permanent Secretary of the Ministry of Environment and Mineral Resources, Ali Mohamed, described Kenya’s journey of green growth as not just an idea but a survival strategy. The Chief Guest, Hon. Amb Chirau A Mwakwere, Minister for Environment and Mineral Resources, acknowledged the contributions of the development partners, especially, the Department for International Development (DFID) of the UK, Danish International Development Agency (Danida), the Government of Japan and the Climate and Development Knowledge Network (CDKN), the NCCAP Taskforce and Thematic Working Groups members, the staff of the National Climate Change Secretariat and the national and international experts who provided management support and technical input throughout the process. The NCCAP, the Executive Summary and all technical reports developed during the process are available here for download.